We are a group of high school (grades 9-12) student-athletes interested in competing in junior level squash. Darien Squash leadership is composed of parent volunteers interested in organizing and facilitating the efforts of the student-athletes. All coaching and training are provided by outside professional programs. Regional and National competitions will allow the athletes to compete with athletes from other programs. 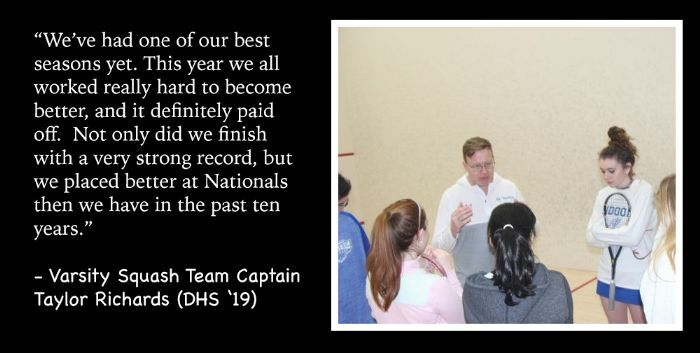 Darien Squash aims to challenge its athletes with continual instruction in a fun and active environment with the best interests of the athletes as the first consideration. The DHS Squash Team is part of he FairWest Squash League which includes ~10 schools and ~400 players in the Fairfield-Westchester area. The FairWest League looks to grow their numbers, and provide a place for players of all levels—whether those who are top-ranked Gold/JCT competitors or just beginners—including private and public school students, to play and get better at squash. It is an outlet for squash players, who may not have the best team programs at their schools, to play more often and with other kids of their same level, or better. As a member of the DHS Squash Team, you will: (1) need a US Squash account, and (2) need to complete the Referee Exam. As a member of the DHS Squash Team competiting in U.S. Squash High School Championship, you will: (1) need a US Squash account, and (2) need to complete the Referee Exam.